I recently closed my portrait studio to focus my shooting time on personal work rather than client demands. 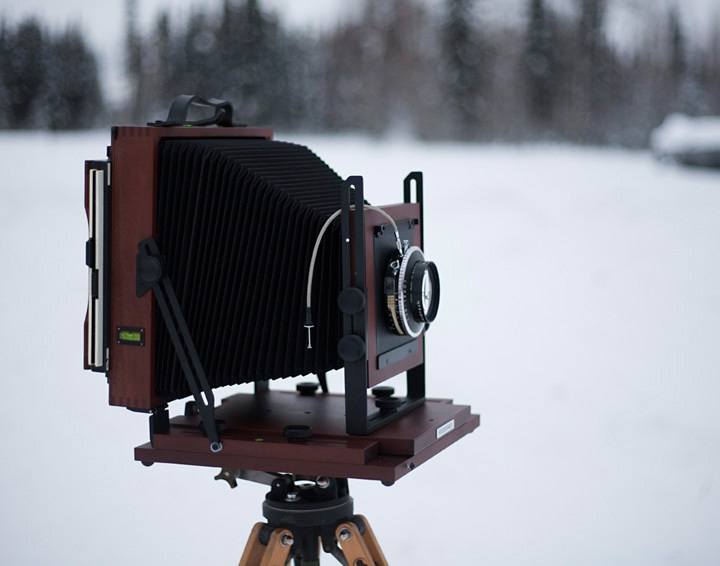 Leaving the studio behind also meant the Sinar P 8×10 had to go and the search for an 8×10 field camera had to begin. I knew I wanted a camera that would minimize weight and have good stability with long lenses in the 480mm to 600mm range. I also hoped to avoid the feeling I’d had with my Sinar of setting up a complex precision machine and gain something more akin to using a hand tool. 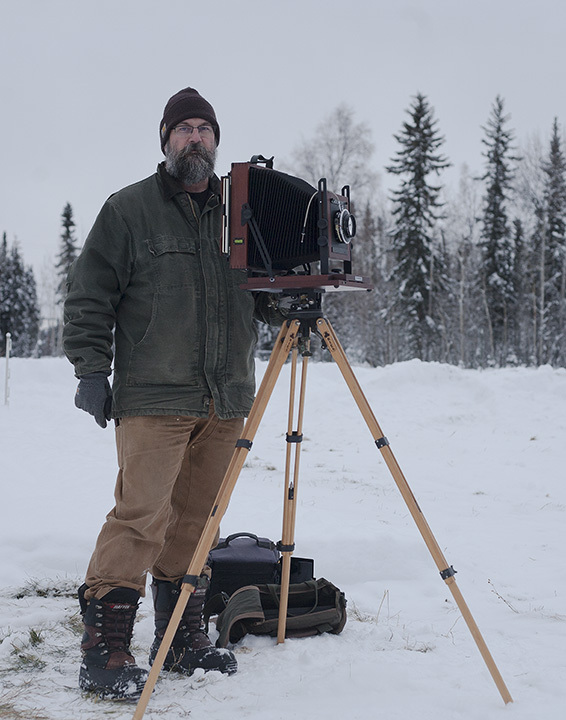 I did as much research as can be done from a remote corner of North America with no real photography stores and very few fellow large format photographers. Without getting into what I didn’t like in the other cameras I seriously considered, as that’s not the point here, I eventually found myself leaning toward the Svedovsky 8×10. At around 12 pounds it’s on the lighter end of the available options and the few reviews I could find of it praised its sturdiness. I e-mailed the company with some questions. Piotr, the sales manager, responded promptly and I liked the answers, so I placed an order. I got the red mahogany with a bail back. I didn’t order a case, as I have a case made by a local manufacturer that I thought would fit, and I confirmed the measurements with Piotr before I ordered. I was out of town when my camera arrived, and when I got back I had to spend several days clearing out my studio to avoid paying another month’s rent and several more days catching up on work at my day job and neglected chores around the farm, and then my job unexpectedly sent me out of town for another week, so other than unpacking to make sure it was not damaged the poor camera sat in my darkroom without a bit of attention for three full weeks. That injustice ended this weekend, and since I had found so few user reviews on the Svedovsky before I thought I would share some initial thoughts. A couple caveats for context: First, while I have a fair bit of experience using a variety of 5×7 and 4×5 field cameras, I’ve only used studio monorails in 8×10, so I can’t make a direct comparison with other 8×10 field cameras. Second, when I sold my Sinar, the buyer wanted my 480 mm and 600 mm lenses. My remaining 8×10 lenses are a 300 mm Xenar and a 240 mm Sironar-N so I can’t evaluate the stability with longer lenses at this time. The fit and finish of this camera is reminiscent of quality Shaker furniture. It’s simple, practical, solid, and resonates quality without extravagance. The woodwork is well done with finger joint corners, lightly beveled edges, and an unpretentious finish. The metal all feels solid, strong, appropriately sized for its assigned job. I have large hands and have often been frustrated with the size of adjusters on various cameras, so I was truly delighted with the size and feel of the adjustment knobs on this one. They fit my hand, they turn smoothly, and they tighten down well. The bellows don’t feel stiff and crinkly, but do not sag, even at full extension. The camera came with a nice ground glass protector and a sock to fit over the front standard. If you like sleek modern lines, shiny chrome fixtures, and high-gloss finishes this won’t be the camera for you, but if you’re the kind of person who finds something comfortable and respectful in simple, well-done craftsmanship then you won’t be disappointed. I’ve never used a Philips-style camera before, and the first time I set up my Svedovsky I found it a bit disconcerting to have the front standard wave around freely, not attached to anything. However it lined up and attached easily and felt plenty solid when secured in the mounting holes. The front shift and swing are secured by the same screw that holds the front standard in place so there is no precision adjustment like I had on my Sinar, but I found it very easy to align edges with edges to square up the standard then loosen the screw just enough that it held some friction while I made adjustments. I was pretty happy to have found that hand-tool feel I was looking for. While it’s a reverse in thinking for me, I found it very efficient to obtain rough focus by sliding the rear standard then fine tune by moving the front standard with the focusing screw. I had concerns about how long it might take to run out the focusing mechanism, but I could run it out to full extension in just a few seconds. As for sturdiness, I ran it out all the way with my 300mm Xenar mounted and could not detect any hint of waver or weakness. It’s not the heaviest lens I’ll ever mount on it, but the Svedovsky’s reputation for sturdiness seems to be deserved. I’ve never used an acrylic focusing screen before. I had concerns about it before ordering, and specifically asked Piotr whether they were as bright as glass and whether a fresnel was required. Piotr said he thought the screen was brighter than most glass screens and he didn’t think a fresnel was needed. I found that it is indeed plenty bright and better than than many ground glass screens I’ve used in low-light. The image is very sharp and I can discern detail and edges just fine with it. I experimented with focusing on snow-frosted power lines against a background of frosted trees, and focusing on piles of accumulated snow on top of stand pipes against a snowy field background and I had no trouble bringing them into focus. However the image is very grainy, particularly when viewed through a loupe. I can’t say it doesn’t work well as a focusing screen, but it’s enough different than what I’m used to that it’s unsettling. Perhaps it’s just a matter of getting used to, and I will give it a fair chance, but I may decide I want to replace it with glass. I’ll be developing a few shots taken in the farmyard in the next couple days (my wife says I have to plow snow, finish her shelf, and repair a light in the barn first). I have a model lined up for an outdoor portrait session next weekend, and this time of year we pretty much have only twilight to work with here, so that will be a good test of the focusing screen. I plan to build a few more lens boards and a 5×7 reducing back while I’m off work over the holidays so I can use some of my other lenses. I’ll try to get some photos posted when I can.